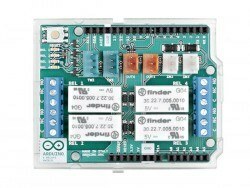 The Arduino 4 Relays Shield allows your Arduino driving high power loads that cannot be controlled directly by Arduino's digital pins. The Shield features four relays, each relay with 2 pole changeover contacts (NO and NC). 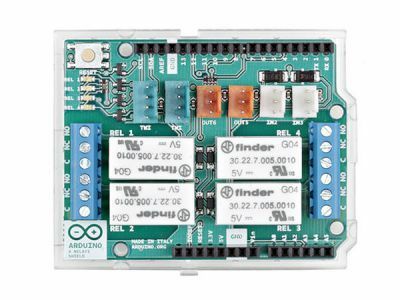 Four LEDs indicate the on/off state of each relay. The shield features several TinkerKit input/output and communication interfaces. 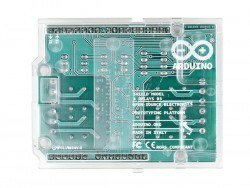 Connecting TinkerKit modules can simplify the creation of a project or a prototype. 2 TinkerKit Inputs: IN2 and IN3 (in white), these connectors are routed to the Arduino A2 and A3 analog input pins. 2 TinkerKit Outputs: OUT5 and OUT6 (in orange), these connectors are routed to the Arduino PWM outputs on pins 5 and 6. 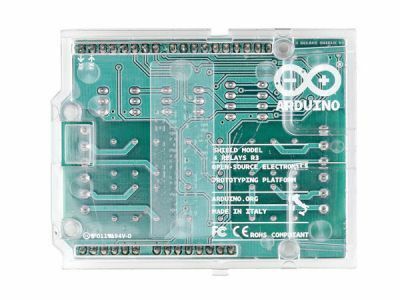 2 TinkerKit TWI: these connectors (4-pin in white) are routed on the Arduino TWI interface. Both connect to the same TWI interface to allow you to create a chain of TWI devices.